The Contraception Mandate: Where Are The Women? : NPR Public Editor E.J. Dionne and David Brooks debated the issue of religious freedom versus the Obama Administration's insurance mandate and both sided with the Catholic bishops. But as some listeners complained, neither is a woman. We looked at the gender voices in all of NPR's coverage on the issue. Read on. 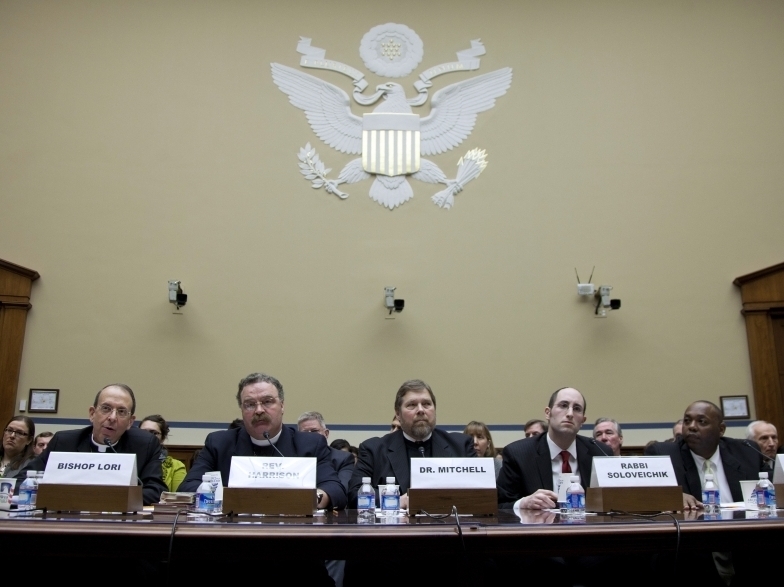 Panelists testify Thursday before the House Oversight and Government Reform Committee hearing. The all-male witness panel at Thursday's House hearing on President Obama's contraception insurance mandate inspired Representative Carolyn B. Maloney, a Democrat from New York, to ask "Where are the women?" A photo of the lineup quickly circulated the Internet—appearing on Twitter and Facebook feeds and landing on women's rights advocacy blogs. Maloney's question—"Where are the women? "—is a familiar one in our office. As the debate around contraceptive coverage continues, several listeners have written with the same concerns about NPR's coverage. The All Things Considered segment, "Week in Politics," on Feb. 10 drew the most concern. The weekly segment regularly features Washington Post columnist E. J. Dionne and New York Times columnist David Brooks. The two columnists discuss the political wave of the week and, between Dionne's traditionally liberal perspective and Brooks' conservative-leaning views, listeners generally can find something they agree with, including even a compromise. Now that the issue of women's right to birth control has come to the fore, I think that it is inappropriate that E.J. Dionne be allowed to speak for the left insofar as he has apparently decided to subordinate women's health concerns to Catholic dogma. Perhaps someone like Gail Collins could substitute for Mr. Dionne while this matter rages in Washington. Both points of view need to be aired (versus the current "Amen" chorus of Brooks and Dionne). Women's rights matter. Women's voices need to be heard on this issue. She is right on one level, though this isn't to say that the two should be prohibited from addressing contraception or any other issue. Brooks and Dionne offer their opinions every Friday on whatever topics may come their way. More important, it seems to me, is to look at how this one segment fits into the whole of NPR's coverage. Did it overall commit the same sin? Our intern Stephannie Stokes reviewed all of NPR's on-air coverage of the controversy between Jan. 13 and Feb. 13. The results were gratifying. Of those interviewed and quoted, 26 were women, ranging from Catholic students to lawyers to professors. This compares to 18 men who were quoted by name. Worth noting, moreover, is that the women represented both sides of the issue, countering the assumption that all women voices would speak in favor of the administration's new policy. The search did not include those quoted indirectly, or reporters or hosts of NPR shows. A report recently released by ThinkProgress, a project of the left-leaning Center for American Progress, analyzed coverage on cable and broadcast news of the administration's contraception mandate. It found a grimmer picture for gender sensitivities. Of the 146 guests brought on cable news shows to weigh in on the free insurance, for example, 55 were women and 99 were men. Airing diverse voices and views that reflect the country is critical. A diverse staff helps in gathering diverse views. The Women's Media Center, an organization that advocates for increased female representation in the media, recently released "The Status of Women in the U.S. Media 2012." The study found that women are still underrepresented in several media areas—print journalism being an immediate example. Let me know if you see something I don't see concerning gender and NPR. Your critiques help keep NPR accountable. Abortion Language: Politically Correct or Politically Bomb-Throwing?